Often you hear us, and your other favorite wineries, spouting the term “limited release” when debuting a new wine. It’s a common term in this industry where every wine produced is unique. That vintage, those vineyards, the barrels used, and the hard work that goes into each bottle made makes each wine different from one another. That’s what makes collecting wine so fun right? There is quite literally a “limited” number of bottles made of every single wine out there. What that means though, can look different for different wineries. In larger growing regions such as Napa Valley, for example, it is not uncommon for wineries to make 20,000-30,000 cases of wine annually. A 1,000 case production Cabernet for them would certainly be considered “limited”. Believe it or not, those wineries are still considered “small” according to industry standards. For comparison, Fidelitas produces about 6,000 total cases annually which just kicks us up from “very small” to “small” guys in this big industry. The wines that we release range between as few as 50 cases, like the very special release of Quintessence Vineyard Sauvignon Blanc, to the high end of the spectrum which is about 575 cases of a single wine like our mainstay, Optu Red Mountain. The point I’m getting to is this: when we say “limited release” we really mean it. Now let’s factor in the amount needed to fulfill Wine Club Member allocations plus Club Member pre-orders...there’s generally a dangerously low amount left over to sell in our tasting rooms or online. This is a good thing, right? Yes. However, we desperately want you to be able to enjoy the wines from Fidelitas that you are most interested in. The only way to guarantee that you’ll get your hands on the most “limited” wines of Fidelitas is by becoming a member of the Fidelitas Wine Club and putting your name on the pre-order or wait lists. As Fidelitas grows, our wines are becoming more “limited” than ever. 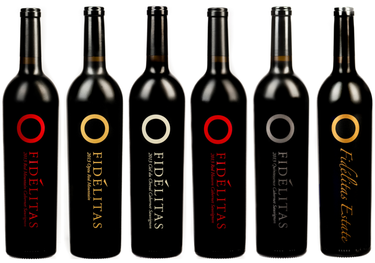 Will you be first in line for the most exclusive Fidelitas wines yet? It’s the best time of year here at Fidelitas because our Ciel du Cheval wines find their way back into the lineup! Who doesn’t love big bold reds from 42-year-old vines? In just a couple of weeks we will be releasing some of my favorites just in time for the holidays. These wines will be available to the Wine Club starting Friday, November 3rd. Not in the Club? Join online today, or email us to get in on these limited release wines before they are gone! This Cabernet offers aromas of fig, blackberry, and quince, dried tobacco, and a touch of cedar. The perfect Cabernet from Red Mountain! One of our most limited wines of the year. The Cabernet Franc is a deep ruby tone, nearly opaque, showing aromas of blueberry, tart cherry, green bell peppers, and a touch of caramel. Last year, this was our Merlot-based blend but we decided to switch it up! This year it's Cabernet-based with aromas of cherry and strawberry with tobacco and black pepper. My favorite Merlot of the year that is perfect for any holiday dish or dinner party. It is showcasing aromas of plums, raspberry, brown sugar, and baking spices. For those who love unique, intense wines! This wine provides black fruit aromas with tones of red currant, figs, and dried herbs.